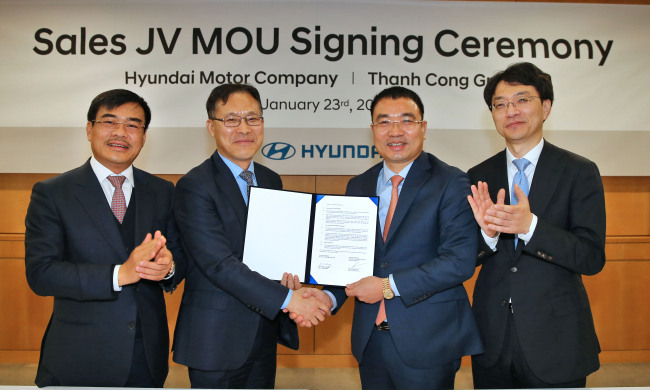 Hyundai Motor has signed a memorandum of understanding with Vietnam’s Thanh Cong Group to set up a joint sales venture as part of efforts to expand its presence in the Southeast Asian country, the company said Thursday. Under the agreement, the companies will work together to expand sales and after-service networks to cater to growing demand in the country’s auto market. Vietnam’s auto market grew 27 percent last year. Established in 1999, Thanh Cong Group is a Vietnamese conglomerate operating construction businesses through it 23 affiliates. The group has been selling Hyundai cars since 2009. Hyundai expects to build a sales network capable of selling around 100,000 units a year. The carmaker sold more than 50,000 units last year for the first time in Vietnam, securing market share of 19.4 percent. Hyundai was the No. 2 carmaker in terms of sales in the Vietnamese market, which has been long dominated by Japanese competitors, the company said. Meanwhile, the automaker posted a net loss of 203.3 billion won ($180 million) for the fourth quarter of last year due to a strong Korean won and a drop in demand. For the entire 2018, net profit plunged 64 percent from a year earlier to 1.645 trillion won.